For some of you reading this, October conjures images of autumn leaves, Halloween, and pumpkin spiced…everything. For me, there’s one additional thing that I associate with October. The Annual International Pelvic Pain Society Scientific Meeting. Every October, for the past 13 years, I’ve attended and participated in this meeting. 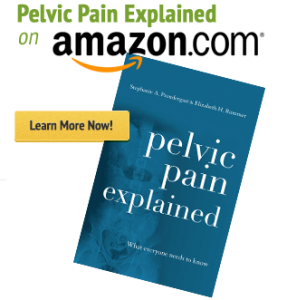 This year, I was pleased to see that for the first time, there was an entire lecture dedicated to persistent abdominal and pelvic pain following hernia repair. At PHRC we commonly treat patients with persistent pain following a hernia repair, but it is not yet an accepted condition among many general surgeons nationwide. John Linn, MD a general and gastrointestinal surgeon from the NorthShore University Health System in Chicago, presented an excellent summarization of hernias, reviewed the surgical repair of hernias, and explained how often and why some people will suffer with persistent pain post hernia repair. It may surprise you, as it did me, that hernias are the second most common condition treated by general surgeons in the United States. The most common is an inguinal hernia, followed by femoral, umbilical, epigastric, incisional, obturator, and lumbar. 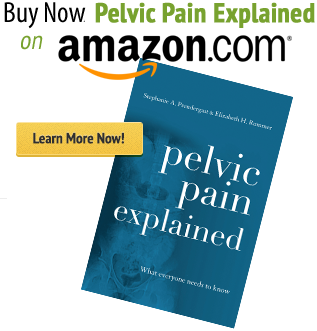 The two types of hernias he focused upon were inguinal and femoral, the most common. In 2016, Dr. Shirin Towfigh from Los Angeles, guest authored a blog for us on hernias. Two years later, it remains one of our top-read posts. People want to know more about hernias. An inguinal hernia happens predominantly in men versus women. In fact, with a ratio of 9:1 male to female. The primary risk factors include being a male, lifting, cough, constipation, dysuria, and a family history. There are two surgical methods to repair an inguinal hernia, either open or a laparoscopic repair. The laparoscopic repair is preferred as it has a shorter recovery, less recurrence, less pain, and lower risk of chronic pain. The reason there is a lower risk of chronic pain is there is no cautery (heating) or thermal dissection which minimizes nerve injury. The mesh that is typically used in a laparoscopic repair is approximately two millimeters in thickness and if used correctly, has a 99% long term success rate. Moving on to a femoral hernia, these types of hernias are more common in women. Who knew? These hernias typically present as a small very painful bulge and they have the highest risk for incarceration. Incarceration is when the intestine gets trapped in the hernia requiring emergent treatment. In those who report chronic pain (pain lasting longer than three months post repair) after hernia repair, there are three nerves that are most commonly involved. They are the ilioinguinal, the genitofemoral and the iliohypogastric nerves. Studies have shown that with open repairs, 10-15% of people report moderate to severe pain. Up to 5% report daily symptoms. The primary risks for developing pain post hernia repair are having an open repair, the use of mesh fixation and a younger age. 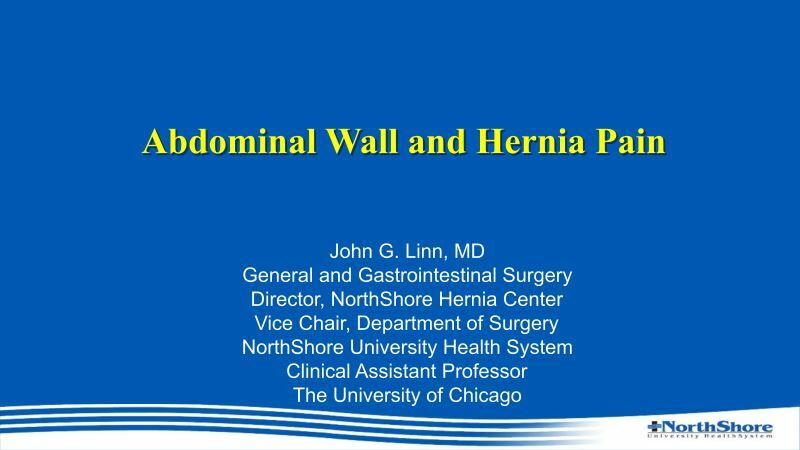 Dr. Linn also reported the primary predictors of pain post hernia repair included female gender, using more than nine sutures or tacks to fix the mesh, the type of the mesh used, and recurrent inguinal hernias. The recommended treatment options for those who have persistent pain post hernia repair are NSAIDS, physical therapy, interventional pain management, neurolysis and neurectomy. Mesh has become a bad word, at least to the consumer of surgical interventions. Dr. Linn clearly pointed out the positives and negatives of mesh products. First, using mesh for hernia repairs is the standard of care for almost all hernias. However, they are often blamed for pain and recurrence. In a perfect world mesh would be strong enough to withstand physiological stress, it would conform to the abdominal wall, it would promote strong tissue ingrowth, it would resist adhesion formation to the organs, it would resist infection, there would be no risk of allergic reaction or foreign body reaction, it would be chemically inert, and it would be cheap. Well folks, I’m here to tell you that that product DOES NOT EXIST. So, what’s our best option? As Dr. Linn described, there are a few components of mesh that could affect the tolerance of the mesh itself. First, is the filament type. Some mesh have monofilament, some have braided, and others have solid sheets. Studies have shown that monofilament are most resistant to bacterial colonization. The next important component is the weight of the mesh. Studies have shown that a heavier mesh can cause more dense scarring and a less porous mesh is more likely to cause chronic pain. In conclusion, he reiterated that hernias are a common condition that affects quality of life. Hernia repairs can be done with a high success rate, but they do carry the risk of chronic pain and mesh related complications. Patients should always be counseled preoperatively on the predictors of chronic pain post hernia repair. I particularly enjoyed this lecture for a few reasons. First, finally we are acknowledging that hernia repairs can cause nerve injuries and chronic pain. Without acknowledging that a problem exists, treatment is rarely offered and/or available. Next, I’m thrilled that he listed constipation as a risk factor in developing a hernia. I often tell patients that constipation is the root of all evil, as far as the pelvis is concerned at least. This is just one more reason that everyone should make good pooping habits a number one priority! And lastly, thank you Dr. Linn for recommending Physical Therapy as the first line treatment for chronic pain post hernia repair. We, as pelvic floor physical therapists, know this to be true, but it’s about time that our surgical colleagues know it too. I have PelvicFloor pain for which I see an awesome P.T. My pain started 4 years after Inguanal repair. Fortunately continuous PT has helped emensly. Finally I have found soneone like me , no pain for several years after inguinal but now for last 3 years getting pain that radiates into my back. After a battery of tests, PTconcluded the nerve has probably contacted thw mesh, which may have slippwd a bit.